Hawaiian shrimp fried rice is easy to make - shrimp, leftover rice, pineapples, eggs and whatever you have left over in the fridge at your vacation rental! Cook the rice by following the directions and measurements on the box, but cut back just slightly on the water. For fried rice, the rice should be less moist and a little more firm. You should make this ahead of time so the rice has some time to cool as the rice is much easier to work with when cool or just a little warm. After the rice is cooled, used a fork and fluff the rice to break up any clumps. Dice the onion (we added onion to the original recipe. We would have used it if we’d had it! ), scallions and pineapple and set aside. Beat the eggs. Next, scramble the eggs in a pan and break them up into chunks with your spatula and set it aside. At the condo, I did not have a large pan or wok so I did two batches. Heat the pan to high, add teaspoon of oil and toss in the scallion/onion and shrimp. Stir-fry for about 30 seconds. 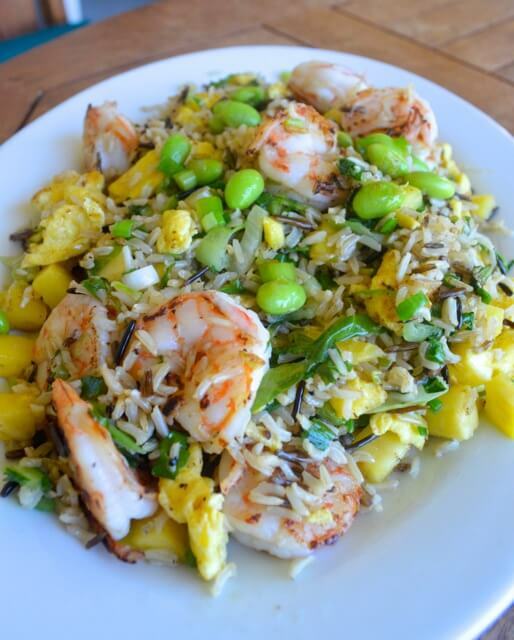 If you decide to add edamame or any other vegetables, add them in together with the shrimp. Add your rice to the mixture and give it a good stir and mix to let rice heat up. At this point, add salt, pepper, and soy sauce to taste. Continue to stir-fry for another couple of minutes. Add the cooked eggs, lettuce and pineapple, and keep stir-frying for another few minutes. Taste and adjust the seasoning if needed. Take it off the heat and serve!